Acrylic on handmade Italian wood panel. 11.8 x 15.7 inches/30 x 40 cm. I love the Corvidae genus and painting this beautiful family of birds. Merlina is one of the ravens that lives at the Tower of London. I have created this image of her glowing, many layered artist quality paint. The colours are optically mixed to achieve a deep richness and are painted onto a handmade Italian Belle Arti wood panel. 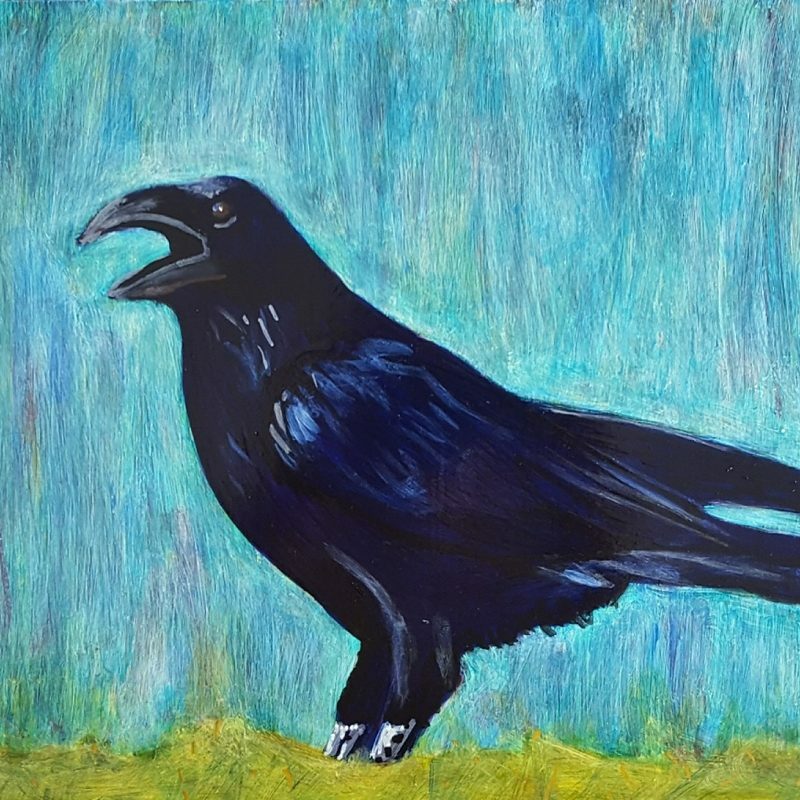 The Raven has appeared in the mythology of many ancient people. Some of the more common stories are from those of Greek, Celtic, Norse, the Pacific Northwest, and Roman mythology. It is not known when the ravens first came to the Tower of London, which was founded by William the Conqueror in 1066. 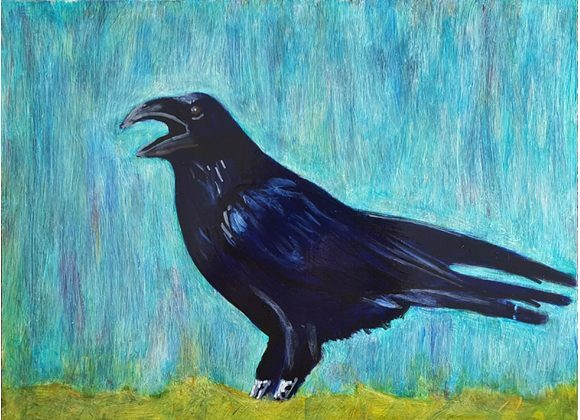 The future of both Country and Kingdom relies upon their continued residence, for, according to legend, at least six ravens must remain lest both Tower and Monarchy fall. The first Royal Observatory was housed in the north eastern turret of the White Tower. John Flamsteed (1646 – 1719), the ‘astronomical observator’, complained to King Charles II that the birds were interfering with his observations. The King therefore ordered their destruction only to be told that if the ravens ever left the Tower, the White Tower would fall and a great disaster befall the Kingdom. Sensibly the King changed his mind and decreed that at least six ravens should be kept at the Tower at all times to prevent disaster. There are seven ravens today - six and one spare!